AIGLE, Switzerland (BRAIN) — Following an injury at last weekend's Paris-Roubaix race, the UCI announced Thursday morning that it has stopped testing disc brakes in pro road racing. MONTEREY, Calif. (BRAIN) — The Brompton World Championships are coming to Sea Otter, and it's the first time in the event will be held on the West Coast. 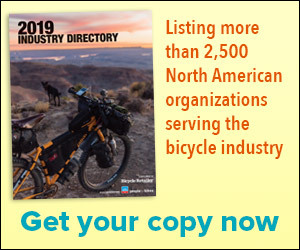 MONTEREY, Calif. (BRAIN) — Since its inception in 2009, the National Interscholastic Cycling Association has established leagues in 18 states, and that effort has helped get more high school kids riding and racing mountain bikes. MONTEREY, Calif. (BRAIN) — Among its many firsts over the years, Sea Otter is hosting the first official electric mountain bike race in the U.S. on Friday. The one-hour race kicks off at 4 p.m.
COLORADO SPRINGS, Colo. (BRAIN) — USA Cycling has named Assos its official cycling apparel partner for the USA Cycling Team through the 2020 Olympic Games in Tokyo. AIGLE, Switzerland (BRAIN) — The Union Cycliste Internationale and Red Bull Media House have agreed to a three-year extension and expansion of its exclusive television production and media rights partnership. BOULDER, Colo. (BRAIN) — Stages Cycling is now supplying the official power meter and indoor bikes to USA Cycling. The agreement covers USAC's developmental programs and the USA Cycling Team on the road and track for the 2016 season, including the Rio Olympic Games. COLORADO SPRINGS, Colo. (BRAIN) — USA Cycling told members on Friday that the organization's website had been breached. RAPID CITY, S.D. (BRAIN) —FedEx has signed on as the title sponsor for the 2016 Strider Cup World Championship for the third year. The sixth annual event is set to be held July 29-30 at Pier 35 in San Francisco. BOULDER, Colo. (BRAIN) — Five years after changing its magazine's name from VeloNews to Velo Magazine, the magazine's publisher has changed the name back. The first issue with the restored name, the April issue, hit newsstands Tuesday. CRESTED BUTTE, Colo. (BRAIN) — The mountain bike community was stunned last summer when Will Olson, a well-known Expert class racer, died after a crash in an enduro race in Crested Butte.